The humble lifestyle blogger of 2017 dishes out unsolicited advice on a weekly basis. You see, everybody is qualified to some degree to share their own life stories and teach one another about what they learned when things went wrong. My blog has taken a turn down the ‘advice for fellow freelancers’ route as my business slowly but surely took over the entirety of my 2017. Work to your own pace, give yourself a break, make your own routine… These are all nuggets of advice that I’ve dished out in the past 10 months, but as I find myself almost completely burned out, why can’t I take my own advice? The unspoken pressure that seems to consume every millennial and their pet student debt is a huge cause. I don’t know about you but I find myself constantly trying to prove myself to others, even when it isn’t something that’s been vocalised by them. Working from home means it’s hard to quantify time and ‘prove’ to others that you work as hard as they do and in an age where physical evidence and digital evidence of Having A Good Time is like gold dust, it’s no wonder that I’m spending all of my time worrying that I’m portraying the ‘right image’. 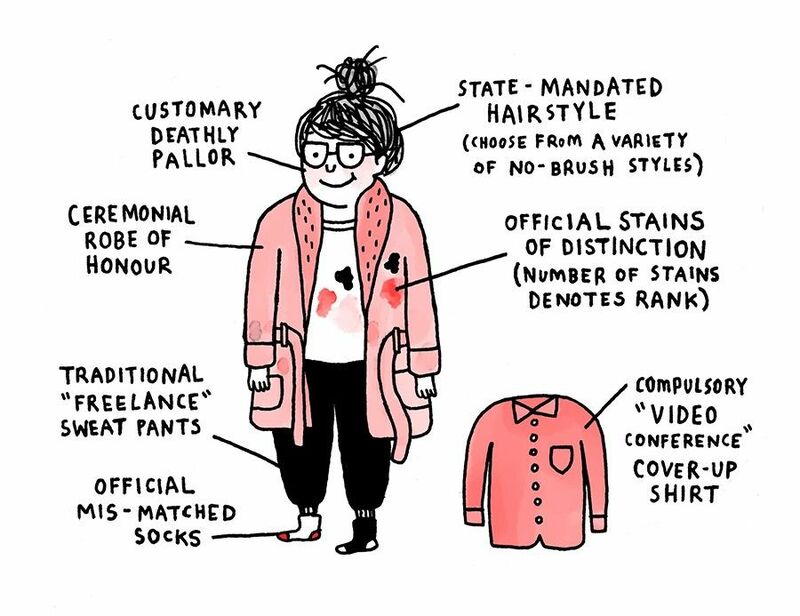 Reality check Mish: there’s no right or wrong for ‘What A Freelancer Looks Like’ (except maybe this illustration by my fave Gemma Correll). At the end of the day, I’m healthy(ish), earning enough to support myself and my future, I have enough leisure time to enjoy with my parents and puppy, and nobody else needs to be involved in what I’m doing. There lies also a running undercurrent of Imposter Syndrome. That old horse. Rebecca of From Roses royalty shared a post all about that but essentially, it denotes that awful niggling feeling that you’re pretty much faking it. I’ve noted before that I believe the British school system completely undermines the importance of prepping kids for the real world but I’ve never once felt 100% confident in a job role. Whether it’s shaking with nerves before attending a trade meeting or having to present your ideas to a wider team or even if it’s go to a meeting that I arranged, I have never been able to shake off the awful feeling that I’m just making it up as I go along. The truth is, we’re all making it up as we go along and each path in this world is different. How I may approach working life isn’t how you might or how another freelancer might, and that’s actually okay. It’s these finer differences that melt into one big pot and bubble over to create a future. The closest I’ve come to beating Imposter Syndrome with my current freelance venture and I’ll bloody well take that! “Don’t let yourself feel worthless: often through life you will really be at your worst when you seem to think best of yourself. And don’t worry about losing your ‘personality’, as you persist in calling it. At fifteen you had the radiance of early morning, at twenty you will begin to have the melancholy brilliance of the moon, and when you are my age, you give out, as I do, the genial golden warmth of 4pm.” F. Scott Fitzgerald, This Side of Paradise. I’ve said on many occasions now that doling out advice on my blog isn’t something I do lightly. I’m an amateur at life, hey I’m only 26! But in writing this post, I realise that every piece of advice serves to help at least one person in the world and if you’re that one person, then my job here today is done.